Greater access and migration tp mining sites contributes to forest loss in the Congo Basin. Congo Basin - BOGOR, Indonesia (16 July 2012)_Seen from the sky, a mining pit might look like ‘a small hole in the canopy’—visually a smaller footprint than the effect of other primary commodity production processes – such as plantation agriculture, CIFOR researcher Louis Putzel concedes. However, in terms of total forest loss, a mine can cause far greater damage by bringing in a large workforce and support infrastructure, according to a recent CIFOR working paper on Chinese Trade and Investment in the Congo Basin. The Congo Basin holds the world’s second largest rainforest, accounting for approximately 18 percent of the world’s tropical jungle. It is famed as the home to chimpanzees and bonobos. But it is also a prime destination for hunting, illegal loggers and mineral prospectors. Within the past ten years, major mineral extraction in the Congo Basin has ballooned at least twenty fold. China – although a relative newcomer to this scramble for resources – has already managed to carve out a major share of the Congo Basin mineral trade for itself. China’s imports of ore and minerals from Africa grew from $350 million in 2000 to $7 billion in 2009. Over 40 percent of that total came from the Democratic Republic of Congo (DRC) alone. So what does the entry of such a resource hungry investor mean for the forests of the Congo Basin? Since China is not an Organisation for Economic Cooperation and Development’s (OECD) country, it is not bound by OECD Environmental Impact Assessment criteria for aid grants to developing countries. That said, as early as the 1990’s, Beijing had already moved unilaterally to ‘restrict credit [to Chinese enterprises] for polluting or otherwise environmentally damaging industries,’ as noted in another working paper from CIFOR’s China-Africa programme. Starting in 2005, the Chinese State Council reinforced that ‘encouragement,’ ordering ‘banks to withdraw credit from companies that do not meet national industry policy and environmental standards’. Such measures could help mitigate environmental damage by large-scale Sino-African joint venture mining projects where the Chinese State government is the main partner, a category which accounts for most of the documented Chinese mining investments in the Congo Basin. However Putzel points out that there is also be a growing amount of undocumented investment in small scale, ‘artisanal’ mining operations that might be untracked. This is not necessarily the case with the ‘artisanal’ mines, which now employ an estimated 700,000 individuals in the DRC. For a quick look at these environmental impacts, you can use publicly available remote sensing tools, such as Google Earth, Putzel says. Take for example, a Chinese joint venture small cobalt mining site in Southeast DRC. Hovering at about 3 kilometres above the forest canopy, the area north of the mine appears as a blanket of green, thriving jungle. Look south and you see barren ground surrounding a cluster of houses and tents, dotted only by the occasional tree. 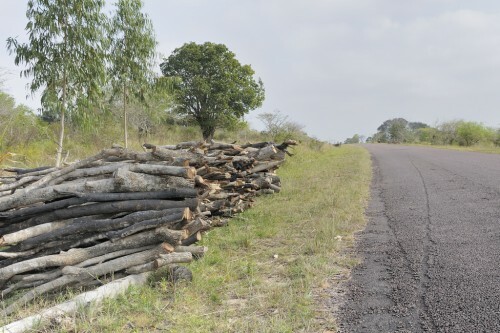 Chinese trade and investment and the forests of the Congo Basin: Synthesis of scoping studies in Cameroon, Democratic Republic of Congo and Gabon.